The winter holidays are here and it is the season for giving and sharing with the people in your life that you love and cherish. What better time of the year than when it is cold outside to sit by a nice warm fire with a great gift making quilt project. Mistletoe by Rosemarie Lavin is the perfect traditional holiday collection with its beautiful poinsettias, pine cones, holly leaves and delicate metallic etchings. 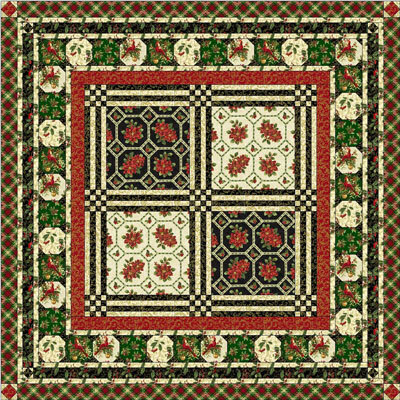 All will feel the spirit of Christmas wrapped in a cozy quilt made of reds, greens, creams and gold. Use Mistletoe to make the perfect heartwarming holiday gift for all your family and friends. Hoping everyone’s holiday is filled with lots of fun, love and great spirits!!!! !Wishing all a happy, healthy and prosperous New Year from everyone at Windham Fabrics! How pleased I am to discover your blog and wonderful fabrics! I don’t know if I can buy them in England, but I now will certainly take time to see if I can buy them on line. I’ll share this site with the English quilters that I know. They may be able to help me buy Windham fabrics in the UK. Just beautiful! I’m found your blog by visiting Craftside’s blog. I’ll be back often to see the new things you have going on.